I was particularly eager to read Anne-Marie Broudehoux’s book when I learned of its publication. I was among the group of students working with Professor Lü Junhua at Tsinghua University’s School of Architecture that the author joined during her first visit to Beijing in the summer of 1993 as a Master’s student in Architecture from McGill University. That summer, Broudehoux and the members of Lü Junhua’s group conducted socio-spatial surveys of the neighborhoods that had been redeveloped and replaced by new housing estates in the center of the old city, and of the new suburban housing sites to which the residents of these neighborhoods had been relocated . It was a time when nearly all faculty and students in Architecture and Urban Planning at Tsinghua and indeed throughout China were taking their first plunge into the maelstrom of development that has since continued nearly unabated to transform Chinese cities. While the fastest increase in China’s urban population took place during the 1980s, it was not until after 1990 that a commensurate increase in the pace of construction occurred. Since 1990, the total amount of built floor space in Chinese cities has increased approximately 250 percent. In short, both the pent-up demand and the response in terms of altered and enlarged urban fabric have been phenomenal. The challenge that China’s urbanization presents to planning, design, and cultural theory in general is equally large. Those involved in the process are excited by the opportunities development presents; dismayed by the destruction of unique environments and social relations; and above all hungry for fresh, relevant, and useful ways to think about the direction the country’s cities are taking. It is in this context, I think, that Broudehoux’s book should chiefly be approached. The Making and Selling of Post-Mao Beijing takes a highly critical look at how the city’s public space has been transformed and how its public image has been constructed in the wake of China’s opening to market forces in the late 1970s and early 1980s. The book approaches the topic by focusing on the development and controversies of two specific urban sites and on the government’s overall approach to managing and marketing the city’s image in the course of its various fin de millénaire spectacles, especially the Asian Games in 1990, the Fiftieth Anniversary of the People’s Republic in 1999, and the Olympic Games bid in 2001. Through an engaging description and a close analysis of these cases, the book outlines how the city’s development has been driven by a larger national agenda to consolidate a new political regime and compete in global marketplaces for capital investment and economic influence. The book illustrates how in this process Beijing has also come under the influence of local governmental boosters and private (mainly foreign) development interests that, sometimes regardless of national goals, behave according to the same patterns that “growth coalitions” have exhibited in cities around the world. These patterns, as described by urbanist scholars such as M. Christine Boyer, Manuel Castells, Mike Davis, Susan Fainstein, David Harvey, and Saskia Sassen, include most prominently the trivializing and commercializing of local history, the fragmentation and privatization of the public realm, and the catering to business elites and tourists at the expense of local communities and less empowered members of society. Broudehoux relies on much of this scholarship in crafting her lens. Even some of the most culturally opaque practices of the Chinese political machinery—for example the relentless reliance on billboard-slogan propaganda efforts to mold public behavior and the campaign to raise the “personal quality” (suzhi) of the population—Broudehoux sees as reflections of a global trend of power elites to turn cities into backdrops for political and commercial spectacles. The book is short on the detailed political-economic analysis that other scholars of growth coalitions have produced, such as that of John Logan and Harvey Moloch, but this is understandable given the secrecy of China’s political machinery; Broudehoux explicitly addresses the topic of “image construction,” not political economy per se. A larger problem of the book is its “reflective” quality, in the sense that it tends to use the emerging image of Chinese cities more as a mirror held up to already-identified global patterns, rather than as a window through which to examine China’s unique problems and situations. But more on this below. I should say first that with respect to describing and analyzing current urban development in Beijing from any point of view, I am aware of no equal in English to this book. Some similar insights on Beijing’s recent transformation can be gleaned from articles by Piper Rae Gaubatz ; by Anthony King and Abidin Kusno ; and in Jianying Zha’s book China Pop . However, there is no book that as richly probes a variety of specific cases of development in Beijing and puts them in global context. Some more recent chapters on Beijing that promise to shed further light on this topic appear in Stephen Feuchtwang’s edited volume, Making Place and in Lawrence Ma’s and Fulong Wu’s edited Restructuring the Chinese City , but I have not had an opportunity to read these yet. Kris Olds’s Globalization and Urban Change  is similar in its focus with respect to Shanghai. Indeed, there is much more scholarship of this kind, mainly in the form of articles, on Shanghai than on Beijing, and it is more methodologically diverse, complementing investigations of cultural expression and identity construction with quantitative analysis of land use and economic structural change and decision-making processes. Why there should be such a disparity is not clear, but it may be due to the political sensitivity of much of the data for the nation’s capital. While the broad thrust of the Shanghai literature is similar to Broudehoux’s argument for Beijing, it would have been interesting and valuable if she had explicitly referred to this literature and thus distinguished some of Beijing’s peculiarities from its more universal trends. The Making and Selling of Post-Mao Beijing begins by comparing descriptions of Beijing by the London Times correspondent David Bonavia in 1978 and by the Chinese blues singer and songwriter Liu Sola in 1994. The earlier description highlights Beijing’s extraordinariness as a “twentieth century city” absent of vice, without “a single bordello or gaming house,” a city even without “privately owned cars, . . . churches . . . commercial advertising and without any night life.” The more recent description “paints the chaotic landscape of an alienated megalopolis, caught up in the swirl of global consumerism.” What strikes the Western reader about this contrast is not only the short time that passed between the writing of these two vastly different impressions, but also the transition from an exotic banality to a familiar one. Indeed, that transition encapsulates the entire book’s focus: how Beijing’s local identity and communities have suffered, and how the city has succumbed to cultural homogenization in the course of its headlong rush into “the Post-Fordist urban condition” and the current era of intensified globalization. These concerns, almost to the word, have impelled many studies of other cities (see for example Timothy Gibson’s account of 1990s Seattle  ), and they frame Broudehoux’s portrait of contemporary Beijing as a city facing similar problems and experiencing similar impacts to those manifested around the world. Although in the book’s introduction she discusses the concept of globalization as a bone of contention between those who emphasize its culturally homogenizing effect and those who emphasize its role as a stimulant of local identity, she presents Beijing dominantly as evidence of the former view. The two specific sites that the book analyzes are especially well-chosen for this purpose: Yuanmingyuan, the formal Qing dynasty imperial gardens in the northwest suburbs of city; and Wangfujing, Beijing’s premier shopping street in the center of the city. In Chapter Three, “Selling the Past: Nationalism and the Commodification of History at Yuanmingyuan,” the former is studied as a case of how historic heritage is defined and presented, and how (as is so often the case in the treatment of historic sites in China) reconstruction is favored over preservation, largely for the following reasons: national identity trumps local identity; consumerism trumps education; and a narrow, xenophobic definition of patriotic education trumps a more inclusive and humanistic definition. Broudehoux writes an eloquent and gripping summary of the gardens’ history, their destruction at the hands of French and British troops in the Second Opium War, their subsequent further marginalization in the landscape of Beijing, and then the debates among policymakers and academics during the 1980s and 1990s over what to do with the site now. Her most original scholarship in this chapter is in outlining these debates and presenting the views of different stakeholders, including residents who have lived in the gardens for over a century but whose continued residence is threatened by plans to reconstruct the gardens to their imperial Qing dynasty appearance. Unfortunately, the book fails to mention the avant-garde artists’ colony that developed there since the early 1990s—a phenomenon that would have supported Broudehoux’s description of Yuanmingyuan as a site with many layers of social and historic meaning, of which only a very few have been recognized by Chinese officials and academics. The central irony in this chapter is that the act of preserving or reconstructing Yuanmingyuan, a unique artifact, and using it to promote national identity, is taking the shape of the global trend of Disneyfication that defeats this very purpose. Other commonly encountered problems of heritage preservation throughout the world are also cited in this chapter: the arbitrariness and power bias in “determining what is worthy to be part of history and what is not” and the tendency to sacrifice socially and economically marginalized or disenfranchised groups’ interests to the interests of heritage preservation in general. Some conclusions of the Yuanmingyuan case are not well supported, for example, that “the state is thus promoting anti-foreign sentiment to protect China from a new Western invasion, that of cultural imperialism, which is threatening not only the cultural identity of the Chinese people, but the political legitimacy of the party as well.” This statement might be more convincing if the propagandistic function of Yuanmingyuan were situated more fully within a larger discourse, such as the central government’ concern about promoting “spiritual civilization” (jingshen wenming) and “personal quality” (suzhi). This discourse is mentioned in greater detail two chapters later, but it really should appear in the first part of the book, since it permeates all of the cases presented. It was commonly discussed in China in the late 1990s that President and Party Chairman Jiang Zemin personally held the promotion of patriotism and spiritual civilization to be a central mission of the Party. Jiang’s interest in historic reconstructions as a form of patriotic education has also been noted, and emerged in his 1997 visit to Pearl Harbor and Colonial Williamsburg. As Richard Handler and Eric Gable have described in great depth, Williamsburg is also a site where heritage has served both educational and touristic-commercial purposes, and thus confronted many of the same conflicts that Broudehoux identifies at Yuanmingyuan. As Broudehoux notes, the romanticization of ruins “appears to be a recent phenomenon in China, related to cultural contacts with the west. According to Wu Hung, in ancient China ruins were mainly lamented in words, especially in poetry . There was a taboo against preserving and portraying ruins, with a virtual absence of visual representations of ruins, which were seen as inauspicious” (p. 92, n. 100). More might be made of this: To what extent were the advocates of preserving Yuanmingyuan’s ruins, as compared with the advocates of reconstruction, exposed to examples of such preservation outside China? How does each faction see the value of ruins in general? What actual words or behavior of the park’s visitors reflect this new form of appreciation? Unfortunately, Broudehoux’s book includes no quotes or any other illustration to answer these questions. The next chapter, “The Malling of Wangfujing: Commercial Redevelopment in the Selling of Places,” examines a place that in many ways is the inverse of Yuanmingyuan: a place where all manner of historic-spatial significance has been denied in an effort to “express compliance with world established norms of modernity.” On this street, Hong Kong-based developers and governmental interests permanently demolished or relocated to distant locations a group of unique commercial and cultural institutions to build the two largest international-standard shopping centers in Beijing: The Sun Dong An and Oriental Plazas. The chapter outlines the many political controversies that surrounded these projects and sums up their impact on local business, residents, and urban culture in general. The main specific historical and cultural losses included the early twentieth-century glass-roofed Dong An Market, with its eclectic mix of inexpensive behind-the-counter shops (historically quite international in their composition until they were purged after 1949); the Jixiang Theater, one of the city’ most important homes to Beijing Opera; and the Central Academy of Fine Arts. These landmarks were replaced by two enormous mega-projects that “through careful spatial manipulations,… [were] conceived as a kind of parallel environment” to the street of Wangfujing outside, with “even street level shops… only accessible from the interior mall” (p. 113). Even after the street itself ultimately became pedestrianized (Broudehoux compares it to the Business Improvement Districts that are proliferating in the West), Wangfujing Street remained something of an accessory or anteroom to these vast commercial domains. However, despite the book’s statement that “the shopping mall represents a radically new type of public space in the Chinese urban landscape,” this development is only the logical spatial extension of all modern specialized shopping arcades, including the old Dong An Market that preceded these latest projects. We may be dismayed by the utter lack of distinction that characterizes most of the tenants of Sun Dong An and Oriental Plazas (many of them are the same chain boutiques that are found in malls throughout the world), but even this phenomenon has a precedent in the international quality that first characterized Wangfujing’s commerce after the establishment of the Foreign Legations nearby, in the late nineteenth century. Parenthetically, in fact there are security guards, but they are discrete, and their function is unexpectedly supportive of civil society in a way that was not formerly seen in China. Once, sitting outside a Starbucks coffee shop in the Oriental Plaza, I was able to observe a complex drama unfold between various levels of security personnel and an eccentric young man who had been sitting in the coffee shop the whole morning without purchasing any items but who from time to time would accost the other customers with disturbing requests. The shop employees and the mall security staff had to walk a fine line between maintaining a customer-friendly atmosphere, and evicting the man, who had been resisting all morning. While their actions can be seen as an example of the kind of consumption-driven behavior control that many urbanist critics decry in the West, in China it represented to me a rather delicate approach to maintaining public order, compared with the cruder forms of behavior control that dominated in pre-Reform days. The maintenance of public order and its relation to urban image construction is the subject of Chapter 5, “Staging the Event-City: Olympics, Anniversaries, and the Politics of City Marketing.” It is in this chapter that the book introduces broad policies of behavioral control, such as the campaigns to promote jingshen wenming and suzhi, and relates them to city-wide spatial management techniques. The resulting picture is of a strange hybrid of market-driven commodity fetishism and state-socialist propaganda and popular mobilization. Billboards displaying government propaganda for “civilizing” (wenminghua) the people and the city, for example, are presented as an example of Walter Benjamin’s “wish image of the collective” that equates the image of the modern city (highways, high rises) with civilization. The chapter ranges widely over various examples of the state’s tendency towards paranoid, “Potemkinist” whitewashing of the urban image: the draconian measures to reduce air pollution; the removal from public sight of illegal migrants, homeless people and the demolition of their temporary settlements; the removal of informal economic activities—all usually temporary and especially in advance of major spectacles or visits by important delegations such as the International Olympic Committee. There is an unwitting irony in Broudehoux’s discussion of the famous Xiushui Street informal Silk Market managing to survive repeated attempts to remove it (pp.184-185); since the book was published, the market finally was torn down. Despite the many important and problematic themes in Chinese governance and planning that this chapter discusses, I found this chapter to be less convincing than the previous two. It is less focused and ends up reading more like a shotgun critique, or even a polemic, than an analysis—not necessarily inaccurate, but also not richly articulated enough to be of much help in understanding Beijing’s peculiar trajectory. There is a disappointing lack of agency in the book’s description of the government propaganda and the public security machine. This lack is not surprising; the decision-making mechanisms behind the state’s undeniable Potemkinist tendencies is highly secretive, precisely because power is concentrated in the hands of so few, and is wielded through an extremely vertical bureaucratic hierarchy. After all, the original Potemkin operated under a similar political absolutism. Still, there is a sense that Broudehoux’s book brings too little historic perspective to bear on the topic of this chapter and grounds its observations on thin evidence. A section on “The Ritual in Chinese Political History” is given all of two pages. The section on “Image and Language” describes the government’s drive to increase the level of English language proficiency among the general population (and thus present an image of Beijing as internationalized in advance of the 2008 Olympic Games) as the reason for “the ubiquitous ‘hello’ cheered by Chinese school children whenever they encounter a foreigner” (p. 182). Any foreigner who has visited Beijing periodically during the last two decades knows that this habit of school children is more popularly ingrained than any particular government campaign could have made it. The chapter, especially towards the end, becomes largely a summary of English-language media reports and an extreme condensation of existing scholarship, with the exception of a section on the fiftieth anniversary of the PRC that includes some first-hand observation and quotes from interviews. Chapter 6, “Contested Visions: Resistance, Subversion, and the Politics of Urban Redevelopment,” describes how residents have resisted their relocation; artists have appropriated demolition for culturally-subversive messages; and a coalition of professionals and journalists questioned the central government’s support of the controversially extravagant National Theatre project. The book sums up the impact of the National Theater controversy in particular as pushing further “embryonic public debates over collective issues” (p. 235). In fact, all of the projects presented in this book have done that in their various ways, especially Oriental Plaza, which was implicated in a scandal that brought down the mayor of Beijing, Chen Xitong. Ending on a positive note, Broudehoux believes that the popular reaction to the city’s rush to modernize has created a new sense of solidarity among Beijing residents and given people the courage to take a stand against government actions. The media, even the official one, has over the past few years been increasingly daring in criticizing decisions made by the leadership, especially those related to the urban environment. Mounting discontent with redevelopment has therefore triggered the emergence of activism in Beijing as people unite their voices to demand more transparent urban governance and popular participation in public affairs. There is indeed an increasing demand for transparency and popular participation. In summer 2004, for example, the Urban Planning Society of China organized a conference on “Democratization of the Urban Planning Decision-Making Process,” the first conference on the topic of participation to be held in China officially. This demand is being made simultaneously from many different quarters at all levels of society. My own feeling is that the “unity” of these various voices is still more a hope than a reality. Reform involves a number of feedback loops that includes different governmental levels and agencies, academics, journalists, business interests, cultural activists, and residents. It would be more interesting to have a sense of how this feedback system works; under what conditions does a petition from academics gain official sympathy, for example, or a journalist feel safe to write without express official approval? Is it the influence of overseas Chinese per se that is the problem, or the fact that most power holders in Beijing are not “locally based”? As the capital city, Beijing is ruled largely by officials from elsewhere in China. Is the conflict really between a “trans-national elite” and “Chinese citizens,” or between a resurgent pan-Chinese nationhood (of which Beijing is at pains to assert its capital status) and a local citizenry for whom Beijing is simply home? Throughout the book, as in its title, it is stated or implied that Beijing’s image is being remade and marketed mainly to foreigners, but there is little discussion of the extent to which this image is being marketed also to domestic Chinese, or how there might be a difference between marketing to ethnic Chinese foreigners and to the world at large. As a city, Beijing suffers a unique set of impositions due to its status as the capital of this complex nation, but the motives behind those impositions are varied and not entirely a matter of private economic gain or even party control. Even the influence of foreign players has been filtered and channeled through a complex network of administrative and other institutional and informal relations. Most of the developers actively engaged in urban redevelopment in the 1990s were not private as such, but rather partnerships formed between municipal or sub-municipal government housing management bureaus or various central government agencies that had current land-use rights and the power to relocate residents on the one hand, and foreign or domestic investors with disposable capital on the other. Given the highly indirect and unaccountable relations through which these influences were brought to bear, both the municipal and central government agencies responsible for development planning were often unable to exercise control. Moreover, the decentralization of developmental policy-making has led to what the Chinese call difangzhuyi, or the localization of costs and benefits and the extreme forms of competition between different governmental jurisdictions that this decentralization engenders. This is evident in the case of the local district government’s decision at Yuanmingyuan to build a theme park, lest theme parks in other places capture the market for this kind of tourism. It also emerges in the case of Wangfujing, in the sense that competition with suburban shopping centers drove the “malling of Wangfujing,” even as planners feared that Beijing in the mid-1990s was already experiencing a glut of large shopping facilities. Scholarship on some of these aspects of Beijing’s and other Chinese cities’ peculiar developmental politics that is not cited in this book includes the writings of Fulong Wu, Yu Zhou, and Yan Zhang and Ke Fang . This brings me back to the questions I posed towards the beginning of this review: What does the book say about China as a unique culture, society and political economy? Is “the stimulation of local identity” utterly absent from Beijing’s fin de siècle encounter with globalization? The book mentions, for example, that one of the central features of Beijing’s continually-evolving image is the city’s enduring role “as a marker of permanence” (p. 17). This role has taken on added shrillness in the post-Mao era, probably to reassure citizens and foreigners alike that China’s period of radical collectivist experimentation is over and that it is safe now to invest. As Broudehoux points out, however, the cultural role of Beijing predates both Mao and the current Reform period. Her argument is that under the influence of global markets, efforts to guarantee and celebrate Beijing’s permanence have been confounded by such a narrow definition of what must be preserved that historic preservation policy has allowed most of the city’s actual lived space to be utterly transformed. This is certainly the case, except that global markets may not be the only culprits; the very notion of permanence in the Chinese context may be grounded in historical roots that have very little to do with markets at all. Alexander Stille has described differences in attitude towards art conservation between Italian consulting conservators and Chinese client museums, pointing out that “permanence” and “authenticity” had very different meanings to the two collaborating groups . The Chinese museums tended to favor reconstruction over conservation. In reconstruction, they favored freedom to reinterpret the original over slavishly accurate replication. In reinterpreting the original, they did not care to distinguish what was new from what was old. The construction of capital cities in China seems to confront a similar problem. While it is important to reaffirm that the current regime is part of an orderly sequence of regimes, i.e., is following certain purportedly-timeless principles, it is just as important to start anew. Only by rebuilding the capital, and demonstrating its economic and political might by doing so, can the current regime live up to the glory of its ancestors. Nancy Shatzman Steinhardt’s history of Chinese imperial city planning implies this pattern . This attitude also permeates the Tsinghua University architectural historian Wu Huanjia’s critique of preservationism in Beijing . It comes very close to the surface in his especially harsh opinion of the Qing emperors’ stewardship of Beijing, which left Beijing essentially unchanged for the duration of their dynasty, and which, he argues was an abdication of their responsibility as rulers. According to this logic, it is precisely the current destruction and remaking of Beijing that affirms most strongly its permanence as the seat of China’s national government. Another theme runs through The Making and Selling of Post-Mao Beijing is the conflict between the “panoptic representation of the city promoted by modernist planners and reformers everywhere” and a Lefebvrian “anthropological vision of the city as a socially constructed ‘space of representation’, which is shaped, experienced, and transformed through everyday practices.” This point gets to the heart of the obsession of planners and urban managers with appearances that are zhengqi (uniform or orderly). To the extent that this is a global tendency of modernist planning, James C. Scott’s Seeing Like a State sums it up nicely. However, in China, this tendency too is actually a more fundamental trait than the current catering to global markets. The question here is how both global modernist and socialist planning have incorporated the persistence of some pre-modern indigenous Chinese planning tendencies, and how these tendencies have both served and been warped by the current regime’s openness to global markets. Broudehoux raises part of this question herself in the introduction—“China’s historical experiment with socialism continues to permeate Chinese society deeply and to shape its vision of modernity”—but the book never quite addresses what the persistence of the pre-Reform planning vision means when combined with the country’s market orientation, other than to complain that “paradoxically, in its drive to build the new ‘socialist market economy’, the Chinese state has ultimately privileged capital over the people” (p. 143). Finally, the title “Post-Mao Beijing” is problematic. To make statements about the post-Mao period, one must distinguish it from the Maoist period. Yet the book fails to take adequate account of Beijing prior to 1980 (or even, in many respects, prior to 1990). The repression and corruption described in this book should be put in historical context. Statements like “it is evident that Beijing’s [recent] urban image construction initiatives often resulted in great social hardship, including exclusion, displacement, and repression, while imposing new limits on civil liberties” (p. 240) appear forgetful of life in Beijing through most of the twentieth century. Most Chinese would probably agree that civil liberties are more extensive now than they were at any other point in the past fifty years. I would have preferred that Broudehoux offer us a more extensive discussion of her experience researching this book. Studies of Chinese cities such as this are few, and it would have been interesting for readers to know how it came about; what challenges were encountered; how the research evolved; and what more could be done. This is especially important given the present dynamic and fluid historical period, of which any book about contemporary China can only take a snapshot. In the short time since The Making and Selling of Post-Mao Beijing was written, the book has so far proven prescient. As I mentioned above, the topics of transparency and participation in governance and urban planning have indeed become more widely discussed over the past two years. Two years, however, are a short time. A book such as this would read even more impressively if it were to address its own speculative nature. This research was published as a series of articles in the journal China City Planning Review, and in Ms. Broudehoux’s masters thesis at McGill. 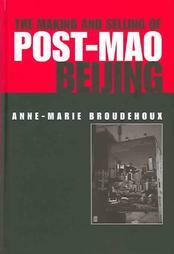 It also informed the doctoral theses that I and two other members of the group produced for Tsinghua, and it ultimately served as the foundation on which Ms. Broudehoux pursued the further research that produced The Making and Selling of Post-Mao Beijing. Piper Rae Gaubatz. “Changing Beijing.” Geographical Review 85, no. 1 (1995): 79-96. Anthony King and Abidin Kusno. “On Be(Ij)Ing in the World: ‘Postmodernism,’ ‘Globalization,’ and the Making of Transnational Space in China.” In Arif Dirlik and Xudong Zhang, eds., Postmodernism and China (Durham and London: Duke University Press, 2000), 41-67. Jianying Zha. China Pop: How Soap Operas, Tabloids, and Bestsellers Are Transforming a Culture (New York: The New Press, 1995). Stephen Feuchtwang, ed. Making Place: State Projects, Globalisation and Local Responses in China (London; Portland, Or. : UCL; Cavendish, 2004). Lawrence Ma and Fulong Wu, eds. Restructuring the Chinese City: Changing Society, Economy and Space (New York, NY: Routledge, 2005). Kris Olds. Globalization and Urban Change: Capital, Culture, and Pacific Rim Mega-Projects (Oxford; New York: Oxford University Press, 2001). Timothy A. Gibson, Securing the Spectacular City: The Politics of Revitalization and Homelessness in Downtown Seattle (Lanham, Maryland: Lexington Books, 2004). Wu Hung. “Ruins, Fragmentation, and the Chinese Modern/Postmodern.” In Gao Minglu, ed., Inside/Out: New Chinese Art (Berkeley: University of California Press, 1998), 59-66. Fulong Wu, “The Global and Local Dimensions of Place-Making: Remaking Shanghai as a World City.” Urban Studies 37, no. 8 (2000): 1359; Yu Zhou.“Beijing and the Development of Dual Central Business Districts.” Geographical Review 88, no. 3 (1998): 429; Yan Zhang and Ke Fang.“Is History Repeating Itself? From Urban Renewal in the United States to Inner-City Redevelopment in China.” Journal of Planning Education and Research 23, no. 3 (2004): 286-298. Alexander Stille. “Faking It.” The New Yorker (June 15,1998): 36-42. Nancy Shatzman Steinhardt. Chinese Imperial City Planning ( Honolulu: University of Hawai’i Press, 1990). Wu Huanjia.“Lun Zhongguo chengshi huanjing de xin yu jiu: yi Beijing wei li” (On the old and the new in Chinese urban environments: the case of Beijing). Jianzhu xuebao 6 (1988): 33-37.